Relationships are tested as individuals flirt with big changes in Lindsay Joelle’s world premiere play “Trayf,” running until June 24 at Theater J.
Shmuel (Josh Adams) and Zalmy (Tyler Herman) are two Chabad-Lubavitchers in 1991 who drive a “Mizvah Tank” through New York. Their goal is to get secular Jews to perform traditional Jewish acts, but their only customer is Jonathan (Drew Kopas.) Raised Catholic, he recently discovered his father’s hidden Jewish identity from when he was smuggled away from the Holocaust as a baby. Feeling aimless in his life as a struggling music producer in Manhattan, he now seeks a connection to this community. On the other side of the coin, Zalmy has been secretly flirting with secular life, starting with listening to non-Jewish music. He agrees to become Jonathan’s “teacher” over Shmuel’s objections (Jonathan is technically a non-Jew, aka “trayf”). Zalmy has ulterior motives, of course, and in a wistful scene that takes place on the upper level of the stage that embodied Brooklyn’s residential streets, the two young men are waxing poetic about each other’s experiences. Jonathan wants the strong family bonds and focus on love and spirituality. Zalmy wants the freedom to wear jeans, meet girls and engage with a different culture. The 90-minute play chugs swiftly forward in time as Jonathan (later “Yoni”) becomes more religious, and Zalmy sneaks out more to roller skate, see Broadway musicals and simply stand on subways with people who look different than him. Shmuel starts to get jealous as his childhood bestie spends more and more time with the outsider, but his defensive personality often precludes him from being receptive to Zalmy’s larger crisis of faith. The mix tape vs albums conflict of the 1990s lends a nice aesthetic to the tensions between these guys, who, after all spend a lot of time driving around in a truck. I also appreciated the play’s soundtrack of popular secular music mashed together with Yiddish boys’ choirs and the like. The Holocaust also featured strongly as a backdrop to this story. Shmuel reminded us that the Chabad Rebbe, Menachem Mendel Schneerson (still alive in 1991) started his particular sect in order to make up for the genocide, and usher in messianic times, by bringing recalcitrant Jews back into the fold. 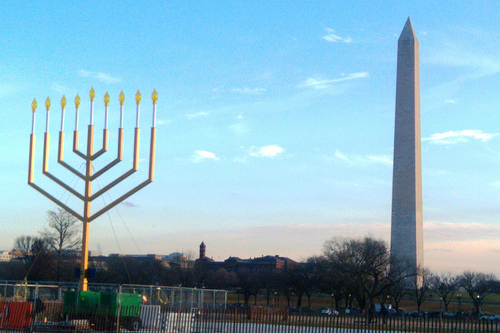 Jonathan naturally feels that call to Judaism after learning about his father’s Holocaust-tinged past. But the Holocaust can also be distancing for Jews. Leah tells Shmuel that her Hebrew school experiences included pretending to be crammed into cattle cars; the lesson she took away was that being Jewish was “a liability.” This underscores my personal argument that it’s dangerous to make Judaism all about this mass tragedy. 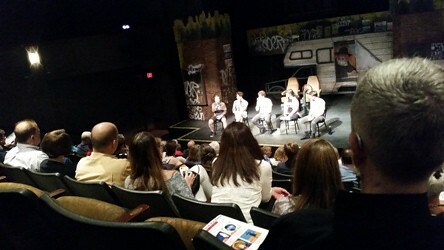 I went to see the play on Thursday, June 14 so that I could also listen to the cast talkback session. Madeline Joey Rose talked about how many times her scene was workshopped in the year preceding production, and how at first it wasn’t even with Josh Adams. Definitely a good change, imho, since Leah and Shmuel were basically the “spurned” parties as Jonathan and Zalmy sought out new relationships. You could feel the tension between Leah and Shmuel’s different worldviews, but also their startling similarities. A couple of audience members had quibbles about word pronunciations and addresses, but Associate Producer Kevin Price explained ways that Theater J reached out to the local Chabad community for input. Lindsay Joelle apparently incorporated a lot of notes, and in a printed dramaturgy interview she detailed her own research, from questioning rabbis and learning how to wrap teffilin to listening to a bris over speaker phone. The play was inspired by her friend, a former Chabad-Lubavitcher who left the community. It won the 2016 Rita Goldberg Award and was a Jewish Plays Project top ten finalist. “Trayf” will be Theater J’s final play before it shuts down for a year of renovations! The 2018/2019 season will be held at the Kennedy Center, Arena Stage, GALA Hispanic Theatre and Georgetown University. Love to the DC community! Check out my past coverage of DC plays on my new “Books, Plays, Movies and Music” page! This entry was posted in Social Events and tagged DCJCC, Just for Fun. Bookmark the permalink. ← Jewish Bollywood Day at the 2018 Washington Jewish Film Festival!